I was on Mac OS Ken last week macosken.libsyn.com/… and on Clockwise this week relay.fm/…. It’s time for holiday cards, so if you want to print your own (cute) address and return labels, check out an old but still useful post to two tutorials on How to Create Address & Return Labels. Bart and I discuss the T2 chip and the impact on your internal drive. Troy Shimkus Seeks the Perfect Road Warrior Setup, and Lindsay chooses a Mind Map to organize Thanksgiving. Then I’ll give you my longer term impressions of the new 12.9″ iPad Pro (spoiler, the Smart Folio Keyboard is my favorite part. Then Bart joins us again for a segment of Security Bits. 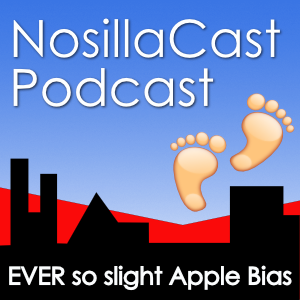 Hi, this is Allison Sheridan of the NosillaCast Apple Podcast, hosted at Podfeet.com, a technology geek podcast with an EVER so slight Apple bias. Today is Sunday, November 25, 2018, and this is show number 707. Last week I forgot to tell you that I got to be a guest on macOS Ken. He normally does a daily news show, but he was taking a bit of a holiday from the news and did a series of interviews with different guests. He talked to Adam Christianson, Jeff Gamet, me and Chuck Joiner. And yes, Chuck was after me. Anyway, it was fun to have the tables turned and to be interviewed. The show was on 14 November, and he doesn’t make it easy to find a specific episode. I put a link in the show notes to the specific episode but it’s such a great podcast you should probably just subscribe to the entire show. Look for Mac OS Ken in your podcatcher of choice. This week I had the pleasure of being on Clockwise again, with Dan Moren, Mikah Sargent and guest Jeff Carlson. We talked about iOS’s Discoverability problem, when we buy gear for ourselves, what our holiday support tasks are, and using an iPad as an external display for a Mac. I bet you can guess which topic was mine. I always have a blast with the Clockwise folks and this was no exception. Check it out at www.relay.fm/clockwise episode #268, but just like Mac OS Ken you probably just want to subscribe to Clockwise in your podcatcher. Just wanted to let you know that the blog post on creating address labels from the Mac Address book continues to be my go-to every holiday season..and it’s the best one I’ve found so far. It actually makes sense and has screenshots, etc., that are helpful. Even though it still takes me several hours to clean up the list each year, your post still saves me hours of frustration. I don’t even remember when the original tutorials were written, but I can tell you I use them every single year to make labels for my holiday cards! The blog post points to two different tutorials. The first is how to How to Create Address Labels from macOS Contacts. It walks you through how to organize your contacts, and then print them onto individual labels with a cute little holly icon. I love this tutorial because I walk you through how you’ll mess it up and how to get yourself out of the mess. I wrote it that way because I seem to always forget a step or two unless I’m paying super close attention to my own instructions. It’s not hard, it’s just easy to skip a step. The second tutorial is How to Create Return Address Labels Using Apple Contacts. You’d think this would be easier, but it’s actually really easy to accidentally print just one label, and at the cost of these little stickers it’s heartbreaking! Again, not hard but easy to do it wrong so I show you the mine fields. I love these tutorials because every year I go visit my friend Doreen and we create her address labels with them. After all the years we’ve been doing it, we’re sure she could do it herself, but it gives us a great excuse to get together, have a cup of coffee and catch up. Her husband Keith thinks we’re nuts to do the same thing every year but we love it. If you’d like to make cute address labels and return labels that are all your own design, check out in the link in the show notes to Make Holiday Card Address Labels with macOS Contacts. Anyway, the good news is that he graciously offered to do an out-of-band Security Bits so we have that this week, along with a short discussion with me on a security topic that I’ll play right now. Next up we’ve got a guest recording from Troy Shimkus I think you’ll really enjoy. He’s got a whole list of topics he wants to record which I think is awesome. He recorded this last week but I saved it, so you’ll hear him refer to something that might happen before Thanksgiving.